Hatteras Raven (4989-0000), part of the 46" Sunbrella Awning collection, is only one of many Sunbrella fabrics that always performs well in the toughest conditions. With Sunbrella fabrics, your customers will never have to worry about fading, mildew, or constant cleaning. The toughness of these incredibly popular fabrics has made them the number one preference for awning applications, such as pergolas, retractable awnings, RV awnings, window awnings, patio awnings, and others. 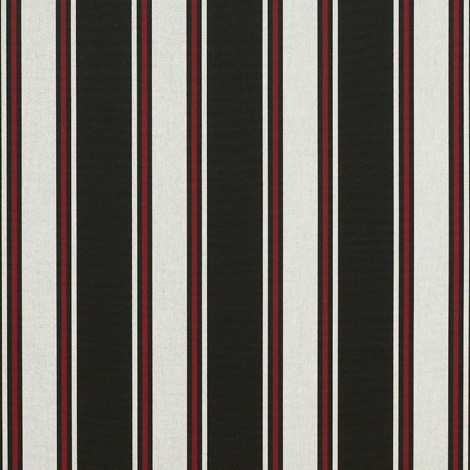 Sunbrella offers a huge selection of colors and styles for you to choose from, such as this amazing pattern featuring striped black and multiple other colors, as well as a corresponding collection of upholstery fabrics. This fabric is created from 100% Sunbrella acrylic, which makes it heat-sealable with seam seal tape, mildew resistant, and water repellent.